I’m going to do something a little different in this posting. There will be no pictures of celebrities or remembrances of the good life in the 60s. Just this once, I’m putting on my pundit hat (or beard) and will pontificate for about the next 400 words. If you're searching for a good scare, this story might just be the most frightening you have ever read. 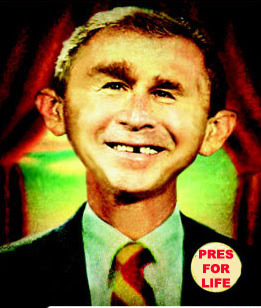 I don’t know about you, but it seems to me that President George W. Bush has already been our President FOREVER! And, when I watch the presidential debates go on and on, I can’t help but imagine that is how it is all going to turn out. The debates will continue to go on and on and on and so will Bush. So when I read Mr. Ratliff’s opening paragraph, a ghostly name change kept popping up in my head like an omen of horrific nightmares to come. “On Dec. 2, Venezuelans (Americans) will be asked to vote on a whopping 69 constitutional amendments that would greatly reduce the country's democratic governance, strip citizens of still more individual liberties and thus expand President Chavez’s (Bush’s) power even beyond what it is today. The sad reality is that voters will probably approve the amendments, as Chavez’s (Bush’s) opponents have been bumbling around, discredited, disorganized and intimidated. 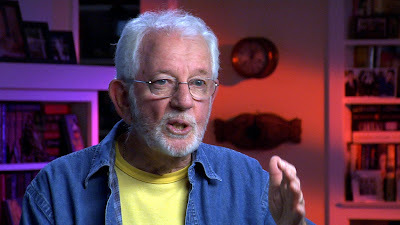 EDITORS NOTE: The opening picture of Lloyd Thaxton was taken from a recent interview given to film maker Thomas Duncan for his documentary on the surfing scene of the 50s and 60s. The second picture is from the official presidential painting which will most likely be placed on top of the capital dome. I think that is so true. We were on a frightening path when the GOP ran every branch of goverment. Now that the Democrats are in, they have done a great immitation of the Republicans. Amen on the Bush scare. Right now, I'm an Obama man, bigtime. Never did care much for either of the Clintons. They're the ones I blame for selling us out to China, for giving the thumbs-up to NAFTA and the Communications Act of '96, and for appointing the SCOTUS "justices" who decided that eminent domain should be unlimited, and should be used for commercial purposes. Barack Obama seems to be the most moderate and most intelligent of the Dems. I will do everything I can to back him, unless I find evidence that he's done something either a) really stupid or b) really sleazy. B O in 0 8 ! Thanks Lloyd I needed a little laugh right now and this "Pundit" blog is it. Yes it is scary to think that George W. may not leave office in 09, if you listen to what political experts like "Thom Hartmann" predicts that there will probably be another major event like 9/11 on American soil before the 08 elections and Bush will postpone the 08 elections and declare Marshall law and we will be stuck with this guy and his accomplices for a long spell. Well, the scariest thing of all about this administration is their absolute belief that they are above the rule of law. In fact, when it comes to the violating of law, civil rights, constitutional protections, etc. it seems that not even Nixon could hold a candle to this bunch. But what is most stunning of all is the separations of powers (the checks and balances system) have all molded into one controlled by the man in the oval office. And the press has taken a turn to the conservative side (not unlike the early fifties) and we as a people have accepted it almost without question. It's a frightening time in more ways than one. I am not worried - all politicians are sleaze bags for the most part, regardless of party affiliation....life goes on, and so will ours.....Merry Christmas and Happy New Year! Mr. Lloyd, I guess one of the reasons I like you so much is that you never grew up. That's admirable in many ways. But now I understand why a citizen must be 18 to vote. If children were allowed to vote, they would vote with their imaginations instead of being grounded in reality. The truth is, Bush is not Chavez or Hitler, or any of the other names he has been called by left wingers. Nor was Bill Clinton Marx, Mao, Stalin, or any of the other names he was called by the right wing nuts. Reality isn't as much fun as fantasy, but we can't remain children forever. A very famous person once said,"And a little child will lead them."" Then another famous person said,"I loathe what you say, but will fight to the death for your right to say it." Aren't you glad we can still name our teddy bears after our leaders without being flogged? It may seem child-like, but I am. Thanks, Mr. Thaxton for you wonderful post. Of course, I remember you very well from 1960's TV, I watched your program often. Your method for searching for movies is our preferred method too. We also can, and often do, lip sync dialog while watching our favorite movies such as Casablanca, The Big Sleep, Key Largo, To Have and Have Not, and many, many others including those fantastic 1950's musicals with Astair or Kelly. I posted a short political note on our high school website (Hollywood Professional School, graduated in '57), about the similarities of the Bush adminstration to that of Chavez. Very scary indeed. Thanks again for an entertaining post.